Lionsgate has finally announced a a release date for the most recently completed Power Rangers season- Power Rangers Dino SuperCharge! Join the Power Rangers for action-filled adventure, as they face extreme dangers and impossible odds to protect the ten Energems. The Rangers must summon all their Dino Super Charge powers to become stronger than ever, and battle the evil alien Heckyl and his alter ego Snide. But a force even greater than Heckyl stands in their way: the Dark Energem! This 4-Disc DVD set will be released on June 27, 2017! The price is a very affordable $19.98 USD! 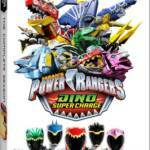 Hot on the heels of the release of the Power Rangers Dino Supercharge Roar DVD comes an announcement for the next installment in the DVD collection for Power Rangers Dino Supercharge – Power Rangers Dino Supercharge Extinction. This new DVD collects the final 10 episodes of Power Rangers Dino Supercharge. Check out the trailer below. Power Rangers Dino Supercharge Extinction will release on DVD March 7th, 2017. Digital HD and On Demand releases will be broken up – Episodes 6-11 will release on March 7th, while the final 5 episodes will release on Digital HD and On Demand on April 4th. Check out the full press release and synopsis by clicking “Read More”! Great news Power Rangers Dino Supercharge fans – the DVD collection “ROAR” has officially been released today on DVD and digital download! To celebrate the release of the DVD, Lionsgate has an activity for you and your kids to take part in while watching the DVD – a piece to color, some tic tac toe games, a crossword puzzle, and a maze! Click the button below to download your own activity page and enjoy watching the show! The final episode of Power Rangers Dino Supercharge, the Christmas special “Here Comes Heximus”, airs this weekend on Nickelodeon. Many fans speculated exactly where in the Dino Supercharge timeline this would fall seeing as the ending of the main story kind of left things … well, prehistoric. 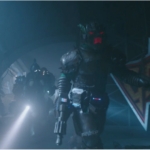 Best rest assured, we see in the following preview clip that this Christmas episode falls AFTER the finale of Dino Supercharge, which ends up leaving a lot more questions on the table as the preview continues. But hey – check out the preview below and we’ll wait and see what developments come out of everything this weekend with the final episode of Power Rangers Dino Supercharge. NOTE: Story image is from Zyuden Sentai Kyoryuger, and will not be in the actual episode. The first portion of Power Rangers Dino SuperCharge is now available on Netflix instant streaming for easy access! This is an excellent opportunity for fans who wish to catch up on this new season! Power Rangers Dino SuperCharge Halloween Special “Trick Or Trial” Preview Online! A new video preview of this weekends’ episode of Power Rangers Dino SuperCharge has been posted online! In this new episode, Trick Or Trial, the Dino Charge Rangers are planning to celebrate Halloween until they are called before an intergalactic court for their crimes of monster destruction. Trick Or Trial airs Saturday, October 8 at 12PM EST on Nickelodeon!